The Romantic Road is the real Germany – medieval towns of half-timbered houses on a route ending at photogenic Neuschwanstein Castle. The German Romantic Road is one of the biggest magnets for tourism in the southern provinces of Bavaria and Baden-Württemberg. Based loosely on the old Roman route between the participating towns and adding in some stunning medieval locations to the north. In the case of the Romantic Road, Germany was desperate to rebuild a tourism industry in the post-war times and the idea of the formal “route” was created in 1950. The first visitors were friends and families of the American soldiers stationed in the large bases in Bavaria and Baden-Württemberg but the idea of the trail from Wurzberg to Fussen soon became wildly popular. It’s not too hard to see the reason for the popularity, despite the modern roots of the idea, the tour combines the historic cities of Würzburg and Augsberg with the three medieval walled towns of Rothenburg ob de Tauber, Dinkelsbuhl and Nordlingen, and then finishes off with the tourist highlights of Neuschwanstein Castle and the Alps. From the vineyards of Würzburg to the foot of the Alps, the almost 400km-long Romantic Road (Romantische Strasse) draws two million visitors every year, making it by far the most popular of Germany’s holiday routes. This well-trodden trail cuts through a cultural and historical cross-section of southern Germany as it traverses Franconia and clips Baden-Württemberg in the north before plunging into Bavaria to end at Ludwig II’s castles. You will find geniune hospitality from those who earn their living on this most romantic of routes. 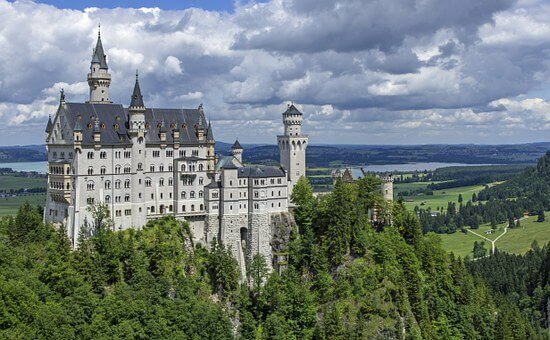 What’s included in your motorhome holiday to Bavaria?